WSP - The Lao People’s Democratic Republic lost an estimated 5.6 percent of gross domestic product, due to poor sanitation and hygiene, according to a report released today by the Water and Sanitation Program. 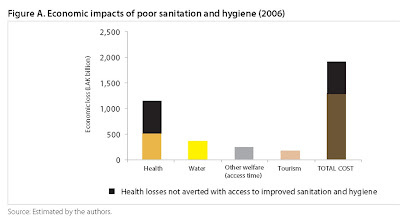 As the impacts evaluated in Economic Impacts of Sanitation in Lao PDR, health contributes 60 percent to overall estimated economic costs, followed by 18 percent for accessing clean drinking water, 13 percent for additional time to access unimproved sanitation, and nine percent due to tourism losses. “These impacts are expected to cause a mixture of direct financial losses as well as indirect or nonmonetary economic losses to the Lao population, who have to pay for health services or for accessing clean water supplies, or who may lose income due to poor health,” said the report’s author and Senior Economist with the Water and Sanitation Program Guy Hutton. Poor sanitation, including hygiene, causes at least three million disease episodes and 6000 premature deaths annually. The resulting economic impact is more than US$115 million (LAK 1.1 trillion) per year based on 2006 data, the report says.